The Loretto School tartan is based on the Musselburgh Tartan, the district in which the School is located. This has been combined with colours from the MacThomas Tartan which relates to the founder of the School, Rev. Thomas Langhorne. Loretto became known throughout Britain during the formative and outstanding headmastership of Dr Hely Hutchinson Almond (1862-1903). Elements have therefore been taken from the MacDonald Tartan which is associated to the name Hutchinson. The main colours of the tartan are a true representation of the School including the ‘Loretto Red’ which is a strong element of the School branding as seen in the iconic red jacket worn by the pupils. The navy blue represents one of the School Houses, “Mackintosh”. Green has been added to represent another of the Houses, “Langhorne” and this colour also reflects the fairways of the golf courses in East Lothian which links up with the Loretto Golf Academy. In addition, pink and purple have been added to represent the two other Houses – “Greenlees” and “Tristram”. The Loretto School tartan has been woven into a 13oz weight cloth suitable for all clothing items. 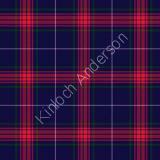 All kilts and skirts can be ordered in this tartan for Loretto School pupils.